Following is the story of Spartan Executive serial number 17’s (S/N 17) service with the RAF. The huge cost and the tremendous loss of life during World War I created a strong desire for a policy of isolationism among many citizens in the United States in the 1930’s. This led to the passage of Neutrality Acts in 1935, 1936, 1937 and 1939. Unfortunately, the acts made no distinction between aggressors and victims, creating a situation where many were looking for ways to get around them to assist friendly nations like England. One restriction associated with the acts was a prohibition on assisting England by providing military aircraft or training services in military aircraft. Because England had a desperate need for additional pilots, a scheme was developed to assist them in satisfying that need. On the surface, the plan was simple and satisfied the requirements of the applicable Neutrality Acts. Three British “refresher” flight schools would be established in the US and civilian aircraft would be used by the schools. To circumvent Neutrality Act restrictions, the aircraft would retain US registration numbers. 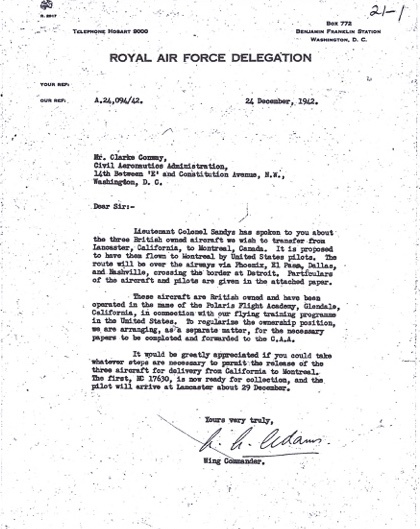 The students would be experienced US pilots who, after graduation, would then be used to ferry aircraft from Canada to Europe, thus enabling RAF pilots who were currently doing the ferrying work to be reassigned to a combat role. That was the plan, but the reality turned out to be much different. More on that subject later. Three flight schools were established; one in Tulsa, Oklahoma, one in Dallas, Texas and one in California. The California school was Polaris Flight Academy which operated out of War Eagle Field in Lancaster, CA. For military flight schools of that time period, aircraft fell into the categories of Primary Trainer, Basic Trainer and Advanced Trainer. While there were different aircraft that could be used in these categories, the Primary Trainer tended to be a biplane like the Stearman, the Basic Trainer would be something like the Vultee BT-13 and in most instance the Advanced Trainer would be a complex, high performance airplane like the T6. 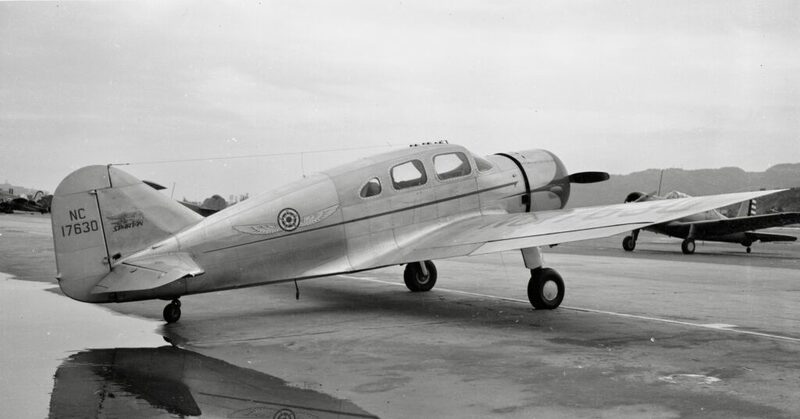 The civilian counterparts to be used by Polaris included J-3 Cubs, Taylorcrafts and Stinson 105’s in the Primary Category while Wacos, Stearmans, Ryans and Stinson Reliants were used in the Basic Category. The advanced category was more of a challenge since there were few high performance, complex civilian airplanes available. Polaris chose the Spartan Executive for that role and three were acquired from private owners. S/N 17 was one of those Spartans. Although the paperwork showed Polaris Flight Academy as the “owner” of these airplanes and they continued to operate with a US registration number, they were, in fact, owned by the United Kingdom Government. Following is a picture of S/N 17 while operated by Polaris Flight Academy in early 1941. The three British Refresher Training schools began operation in early 1941 and they continued accepting new students until shortly after the US entered the war in December 1941. Existing students continued their training throughout much of 1942 until the final student completed the course. At that time, Polaris and the other schools became training facilities for the US military, using military aircraft and curriculum. The civilian aircraft were no longer needed for training and a decision was made to transfer the three Spartans (already owned/operated by the British) from Polaris Flight Academy to the RAF, for assignment to the RAF Ferry Command in Montreal, Canada. This occurred in late December 1943. S/N 17, which had been operated by Polaris as NC17630 was reregistered as KD 102. The other Spartans became KD 100 and KD 101. Of the 14 aircraft confirmed to have been operated by Polaris for the British “Refresher” training program, only three remain on the FAA registry. Of those three, the only airworthy survivor is Spartan Executive S/N 17. The three Spartans remained in service with the RAF Ferry Command, providing light transport tasks in Canada through the end of the war. All were released from military duties in the fall of 1945 and sold to new owners in the US shortly thereafter. KD 100 was destroyed in an accident in the early 1950’s. KD 101, currently registered as NC17617, is awaiting repair/restoration after involvement in a landing accident. KD 102 flew a total of 530 hours during its wartime service and is the only surviving Spartan in airworthy condition that served in the RAF. It is currently registered as NC17634 and is frequently flown to and displayed at major aviation events. The following picture shows the current appearance of S/N 17. While the above seems pretty straightforward with Spartan S/N 17 first serving the RAF as an advanced trainer in California and then as a light transport aircraft in Canada, it is what was going on behind the curtain and the individuals who were directly involved with the Spartan that paints a far more colorful and interesting history of the Spartan’s time with the RAF. The following paragraphs will try to complete the overall picture. In the late 1930’s and similar to what we are going through today, the country was divided regarding which direction to go as it relates to the affairs of the European nations; specifically, the war that Hitler was waging throughout Europe. One group favored an isolationist position and who group had been successful in having the various neutrality acts passed in the mid to late 1930’s. Another group was in favor of helping our friends in Europe defend themselves from Hitler and the Third Reich. That group sought to circumvent the neutrality restrictions and to change the opinions of the isolationists. As often occurs, Hollywood took on the role of trying to change those isolationist positions. The reigning female star of the day was Betty Grable who was cast in the lead female role in a film ultimately titled “A Yank in the RAF”. The original name was to be “The Eagle Squadron.” Without going into great details, the male lead (Tyrone Power) was a hot shot American pilot that first took on the assignment of ferrying a transport aircraft from Canada to England. Once he got there, he joined the RAF so he could fly fighters for the British. The underlying tone of the movie is that Americans should be helping the British to defend themselves. 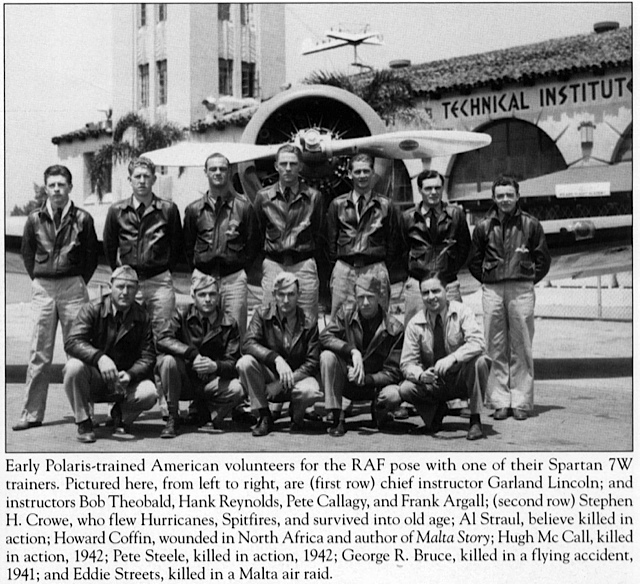 Since Hollywood was quite close to War Eagle Field in Lancaster, Betty Grable made a visit to Polaris Flight Academy and posed for a number of pictures in front of Spartan S/N 17, along with various individuals associated with the RAF “refresher” flight training program. In one picture Betty is standing between Squadron Leader Stuart Mills, the RAF officer in charge of the three training schools in the US and a student pilot named Forrest M. Cox. More about Forrest Cox in a moment. The following pictures shows from left to right – S/L Stuart Mills, Betty Grable and Forrest Cox. Many, if not most of the pilots who trained at Polaris made their way to England to join one of the three Eagle Squadrons. The overall number, however, was relatively small because the need for those squadrons was short lived. They were first formed in early 1941, but after the US entered the war in December 1941, the neutrality acts were rescinded and America could openly support England without this backdoor approach. By September 1942, all American members of the Eagle Squadrons had been transferred to the USAAF. In total, approximately 250 Americans became member of the three RAF Eagle Squadrons. Of that number, 78 were killed while with the RAF and 16 had become prisoners of war. Twenty-nine more were killed after their transfer to the USAAF and 18 were captured. The following picture taken at Polaris Flight Academy shows seven students and five of their instructors in front of a Spartan Executive used by the school for the advanced training segment of course. 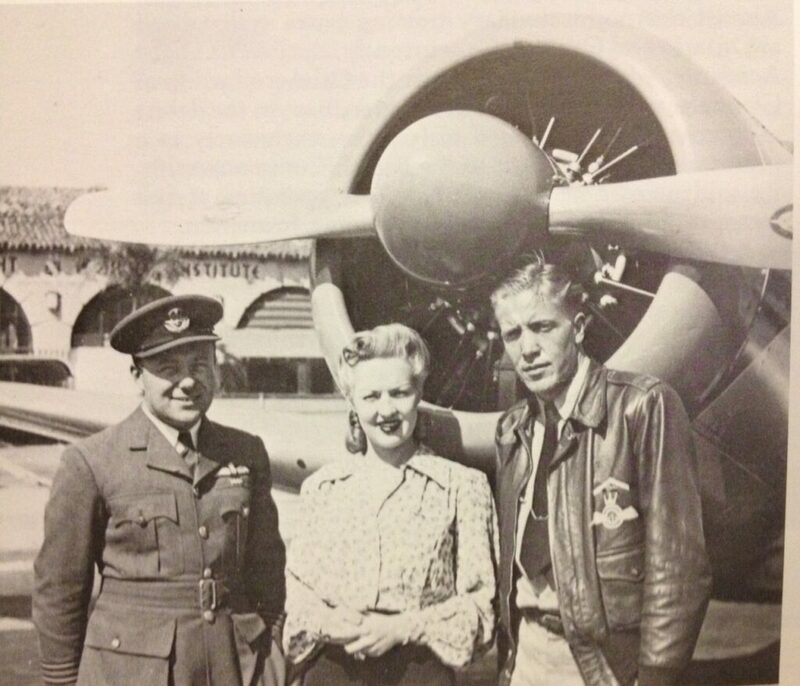 When Betty Grable visited Polaris Flight Academy in the Spring of 1941, she had several pictures taken with a student named Forrest M. Cox. While attending Polaris, Forrest flew Spartan Executives, the only advanced trainers used at Polaris, for a total of 17 hours. Although the program was marketed as a “refresher” course for experienced pilots, Forrest’s total flight time when he departed Polaris was 214 hours with more than half of it in airplanes having less than 100 HP. After joining the RAF, he flew a Miles Master for 10 hours before moving up to a Hawker Hurricane. Thirty more hours in the Hawker and he began flying a Spitfire with Eagle Squadron 121 in September 1941. In the one year he flew with the RAF before being transferred to the USAAF, he flew approximately 600 hours of wartime missions. His logbooks are incredibly fascinating and I am humbled to think I am flying an airplane he once flew. The next phase of S/N 17’s began January 1, 1943 when it was transferred from Polaris Flight Academy to the RAF Ferry Command in Montreal, Canada. With this move, the registration changed from NC17630 to RAF registration KD 102. 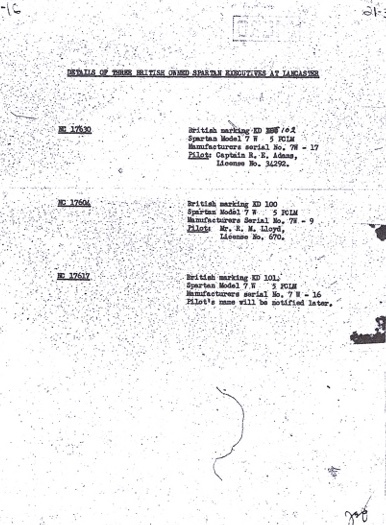 The following transfer letter confirms these aircraft had, in fact, been owned by the British during the time they were operated by Polaris. After arrival in Montreal and during their service with the RAF Ferry Command, it appears the Spartans settled into a role of light transport duties flown within Canada. Nevertheless, there were a several documented flights that are of significance to me, the current owner/custodian of S/N 17. The first two flights of interest occurred on May 17 and 18, 1943. Those two flights consisted of a round trip from Montreal to Toronto and back to Montreal. To understand the significance, of those flights to me, we need to look at a seemingly unrelated topic. Waco CG-4 gliders played a significant role in transporting troops and supplies. These gliders were built in North America by companies such as Waco, Cessna, Ford, Gibson Appliance and Ward Furniture. The obvious problem with building these large gliders in North America was getting them to Europe. The normal way to accomplish that was to disassemble them for transport by ship. In 1943, a high risk plan was put together to tow a glider nicknamed Voodoo, loaded with 3360 pounds of supplies, behind a loaded Dakota (C-47) across the Atlantic from Canada to Scotland. This was to be done in three legs, with stops at Goose Bay, Labrador and Reykjavic, Iceland. Although the risky flight encountered numerous weather related issues during the crossing, the flight was successfully completed on July 1, 1943. Because of the significance of this flight and the risks involved, the pilot and co-pilot of the C-47, as well as the pilot and co-pilot of the glider were awarded the Air Force Cross, the highest non-combat award available in the RAF. 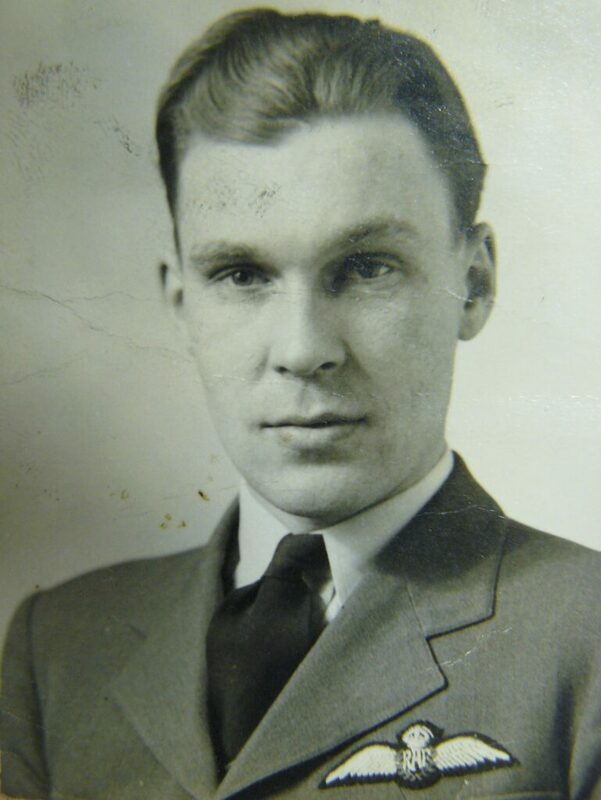 The pilot of the C-47 was Flight Lieutenant William Sydney Longhurst. At the conclusion of the war, Longhurst had a successful career as a test pilot with Canadair Limited. So how does this relate to Spartan Executive S/N 17? A review of F/L Longhurst’s logbook shows the last flights he made prior to the historic glider tow across the Atlantic were flown by him in KD 102 on May 17 and 18, 1943. 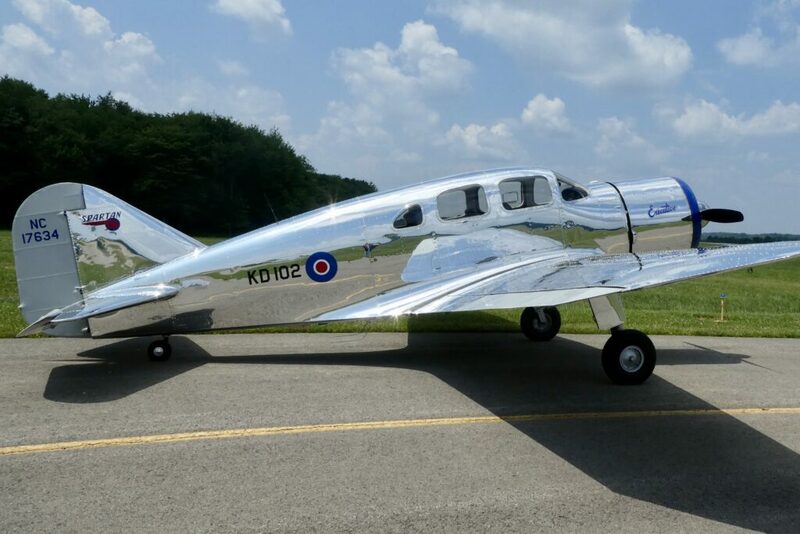 For the owner of a vintage aircraft, knowing it was actually flown by someone such as F/L Longhurst, a recipient of the Air Force Cross, is quite gratifying. Knowing his Spartan flights immediately preceded his Atlantic crossing that earned him the award, is the icing on the cake. F/L Longhurst also flew S/N 17 on August 21 and 22, 1944 from Montreal to Ottawa and back to Montreal. 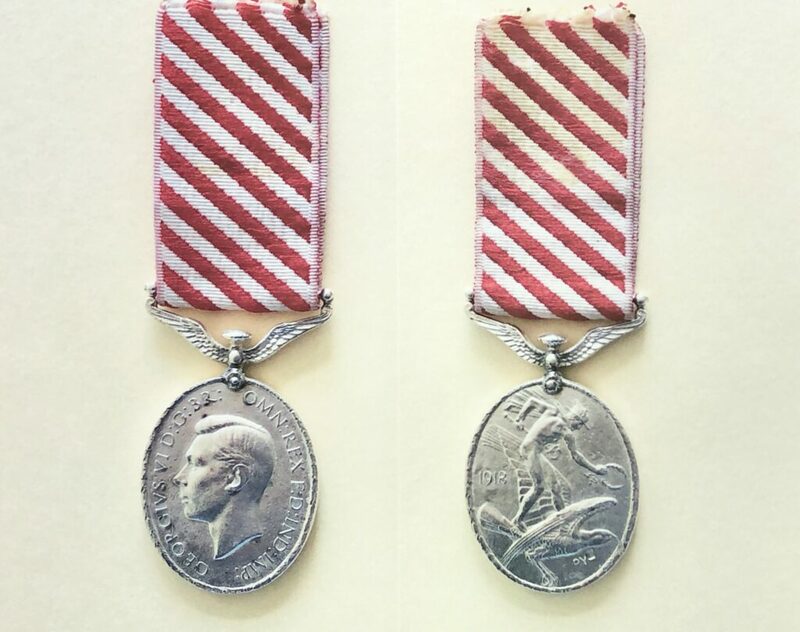 Following is a picture of F/L Longhurst taken during the time he served with the RAF Ferry Command and one of the front and reverse sides of an RAF Air Force Medal. The final set of flights of interest to me occurred two years later on February 3 and 5, 1945. The flights were from Dorval, CA to London, CA and return to Dorval. These flights were made by a young RAF pilot named Peter Finlayson. While there is no particular significance to the actual flights, it is Peter who is significant to the legacy of S/N 17. 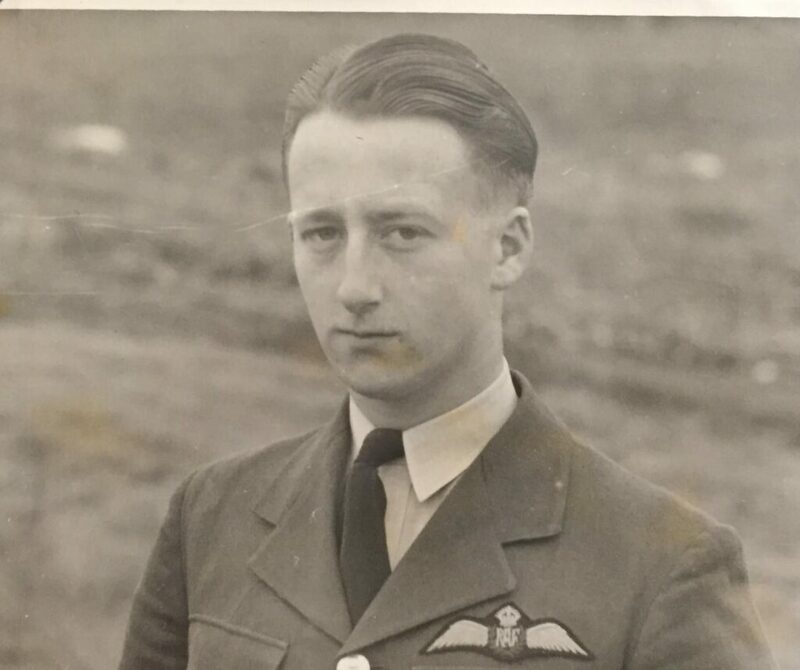 Peter survived the war, remained in the RAF and retired in 1975 as Group Captain. I had the good fortune to get to know Peter over the past 11 years via the Internet and his son Nigel. 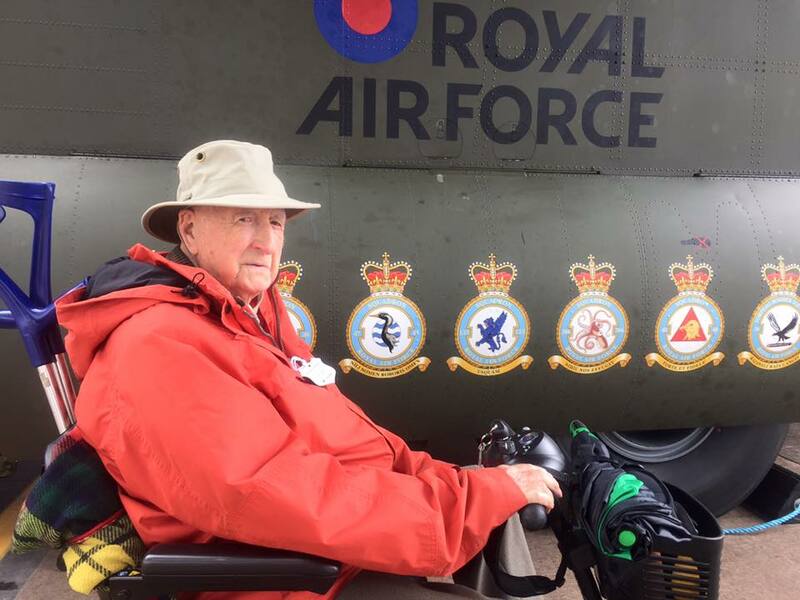 To the best of my knowledge, Peter was the last living person who had direct contact with S/N 17 in either of the two roles the aircraft fulfilled for the RAF during the war. For someone who owns a vintage airplane, getting to know the RAF officer who actually flew it more that 70 years ago is a rare privilege. Regrettably, Peter died in early 2019 at the age of 98. The following are two pictures of Peter. The first was taken in Canada around the time he flew KD 102 in 1945 and the second was taken a few years ago in England.